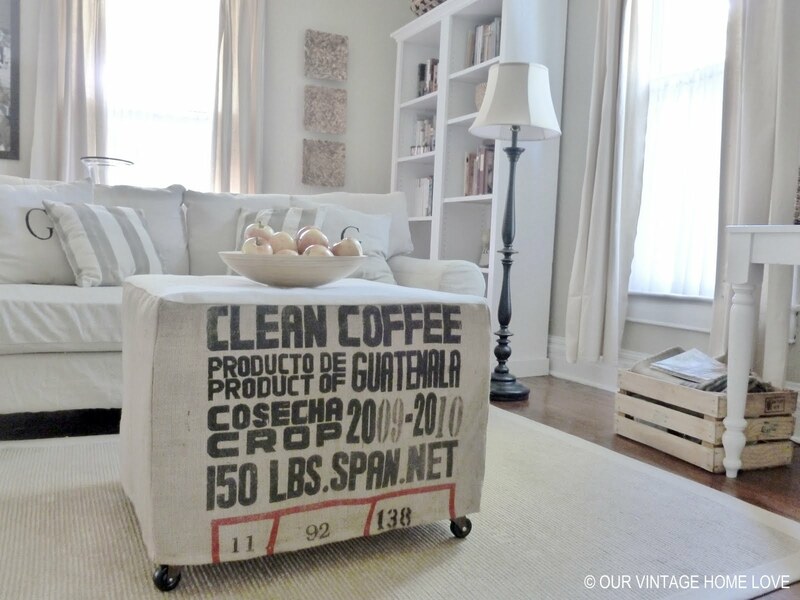 Remember all those coffee sacks I picked up at the farm supply store? Well, I decided to use some of them to make a slipcover for an ottoman I built and I am so stinkin' happy with the results! I love this thing! And considering I didn't really have a plan and just kinda created as I went along, I'm so happy that the end result was the way I saw it in my head and not a big pile of junk. I wanted to make it as inexpensively as possible so the only thing I bought was two 2 x 4's for the frame and 4 castors. I started out by making the frame with the 2 x 4's. This is the frame I came up with. I ran out of 2 x 4's during the process, so, I used some scrap wood we had in our shed. My frame measurements were 24" width and length, and 18" high. After finishing the frame, I needed to find something to attach to the sides. I didn't want to buy anything, so again, I used something we already had, which happened to be these wood strips that I had purchased for my Father's Day gift for my hubby. Plywood would work just as well. The goal here was to spend as little as possible to make this and use things I already had. I attached those all around the frame with a nail gun leaving about an inch space between each one. There was no reason for that, I was just trying to make sure I had plenty to cover the entire frame. Next up was the top. Since this was an ottoman, the top needed to be strong enough to sit on and those lattice strips aren't strong enough to hold a person, so, I used some thick maple scraps I had laying around from making bread boards. I attached those with a nail gun, as well. I'm actually starting to be able to use the nail gun by myself without being terrified uncomfortable. I really wanted to put castor wheels on this because, well, I love castors and being able to easily move a piece of heavy furniture around if I need to is a bonus. So, I headed to Lowe's and found these. I really liked the copper/bronze look and thought they would pair nicely with the coffee sack that I was planning to use. And they only cost 5.69 for a pair. After attaching the castors, I brought it inside to finish. I wanted the ottoman to have some cushion to it, so, I wrapped it in medium loft batting. Next I measured out the sides and top and cut the appropriate pieces from the coffee sacks. 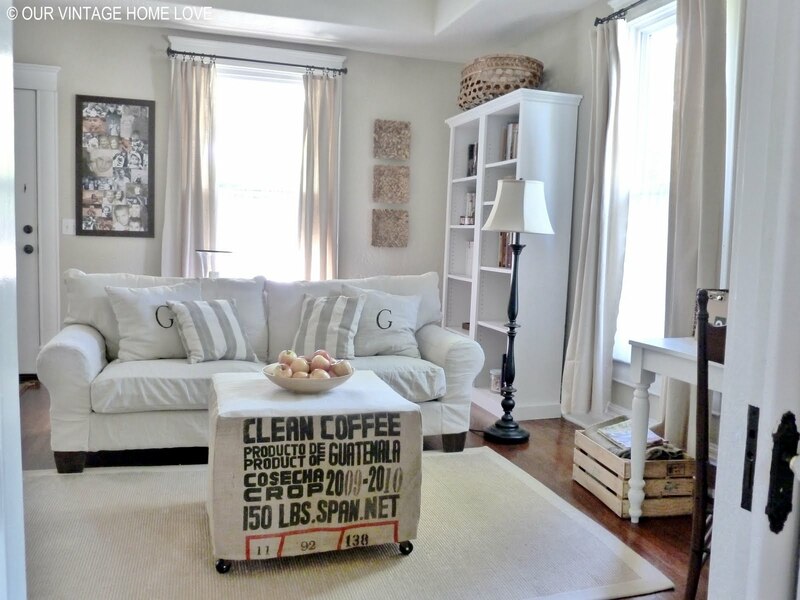 For the top, I used canvas drop cloth instead of burlap coffee sack. Burlap isn't soft and I wanted the top to be comfy in case we wanted to rest our feet and legs up there. After measuring and cutting all the fabric for each section, I placed the fabric on the ottoman, inside out and pinned. Then I removed it and sewed and then gave it a good ironing. Sorry, I didn't get a photo of the sewing part, I was trying to get it done before it was time to start dinner. And that's it! I can't tell you how excited I was when I slipped the slipcover over the frame and it fit!! I'm still new to sewing my own slipcovers. 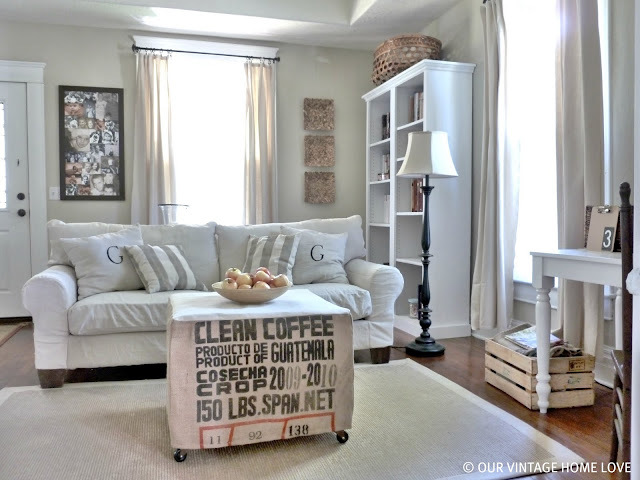 :) I chose to make a loose slipcover, instead of actually attaching the fabric to the frame with a staple gun, because I preferred the loose casual slipcover look for this project better. 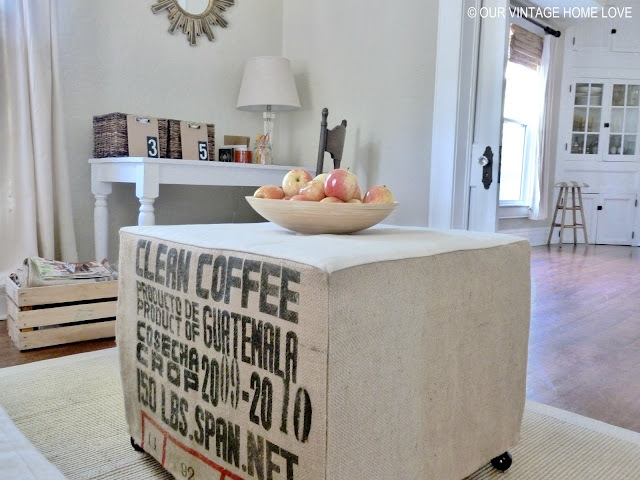 I am LOVING this ottoman! And the castors peeking out from the bottom are a fun addition. I'm not the best at tutorials, but I hope these instructions are clear enough should you want to make one for yourself. :) And if I just confused you, you can always contact me with questions and I will help as best I can! I am huntin' for some pretty fabrics for fall to change out the pillows on the couch for the fall season. I can't wait! Linking up with TLC today! Come join the fun! It's a party! Love the ottoman and can't wait to hear about the larger bread board! What a great idea! Thanks for the awesome tutorial!I love your ottoman! It's beautiful Diana! 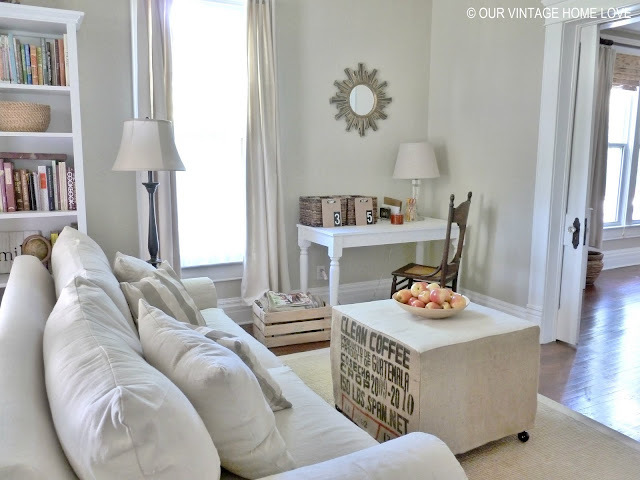 I tried my hand at a slipcover earlier this summer and it turned out okay so for now it stays. I used a tutorial from Jennifer over at Dear Lillie and it was easy and quick but my ruffle making needs some serious help! Check it out in my May archives if you'd like. This is wonderful, you did a great job. The graphics really add a pop in your space!! Genius! Seriously, is there anything you don't think of? I love it...and you even centered the graphics! 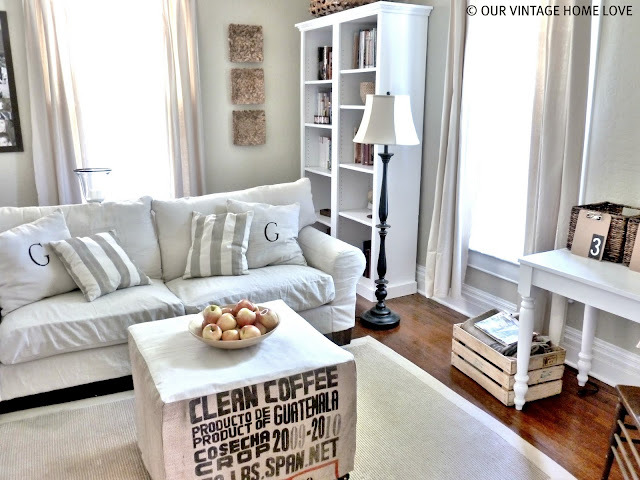 What a beautiful ottoman...happy Monday to You! Hugs. A very cool and useful piece. I think it's great that you could use up lots of scraps for it too. Great idea! Love it. Thanks for sharing. Super job! You are very talented to 'create' so many things with wood. I love the way you covered it. Great tutorial. Love your one of a kind, unique ottoman. your ottoman looks fabulous.Do do such fantastic work. What a great idea. I love the casters. I now my hubby would be moving it around to put his feet in just the right spot. Can't wait for mre boards to be in stock! I love this, it is fabulous! You did an amazing job and your room is gorgeous too. This is so unique! I love it! Thanks so much for the great tutorial! This is so SO creative; it makes me happy just to sit and stare at it!! I love the graphic quality, and the fact that it was made so inexpensively. Absolutely adorable. 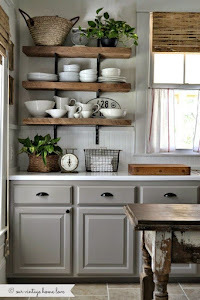 Your kitchen table really inspired me; I'm going to start on a project this weekend using your plans! Thanks so much for sharing your tutorials!! What a brilliant idea ..... have you seen these ? Thank you for all the sweet comments! Sasha, I can't wait to see your pillow covers!! I love fall! Very creative...your instructions are clear. Thanks I will be back to visit again. And Thank you to Ana White for linking me here to your blog. I'm teaching myself how to sew again after 30+ years, and I stumbled across this idea via Pinterest. Love it!